Any Baedeker will tell us where we ought to travel, but only Alain de Botton will tell us how and why. 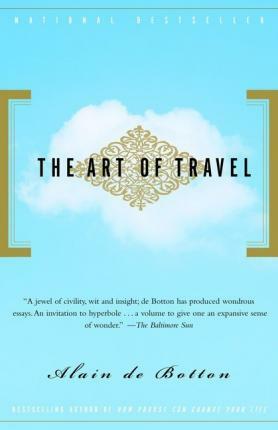 With the same intelligence and insouciant charm he brought to How Proust Can Save Your Life, de Botton considers the pleasures of anticipation; the allure of the exotic, and the value of noticing everything from a seascape in Barbados to the takeoffs at Heathrow. Even as de Botton takes the reader along on his own peregrinations, he also cites such distinguished fellow-travelers as Baudelaire, Wordsworth, Van Gogh, the biologist Alexander von Humboldt, and the 18th-century eccentric Xavier de Maistre, who catalogued the wonders of his bedroom. The Art of Travel is a wise and utterly original book. Don't leave home without it. Any Baedeker will tell us "where we ought to travel, but only Alain de Botton will tell us "how and "why. With the same intelligence and insouciant charm he brought to How Proust Can Save Your Life," de Botton considers the pleasures of anticipation; the allure of the exotic, and the value of noticing everything from a seascape in Barbados to the takeoffs at Heathrow. Alain de Botton is the author of On Love, The Romantic Movement, Kiss and Tell, How Proust Can Change Your Life, The Consolations of Philosophy and, most recently, Status Anxiety. His work has been translated into twenty languages. He lives in London. More information can be found at www.alaindebotton.com.